The hip abduction Orthosis is indicated for fractures, post-surgical revision, select total hip replacements, and inoperable hip disorders. It is created from padded plastic shells that fit around the hips and thigh, a metal hinge for the affected hip, and velcro straps to maintain contact to the hip. The Orthosis is effective in maintaining the hip joint in position by utilizing a complex multi-axial joint that allows the Orthopedic Surgeon to set the parameters of mobility until appropriate healing has occurred. 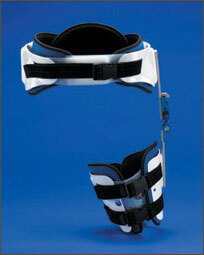 The brace must be worn quite snugly to ensure effective control of all hip movement.